Miss Jenny, you are the best with your bear, bees and beautiful post!!! Seeing your link popping up, decide to share a story I wrote this morning. will try to visit some talented writers. BEST BEAR ever, Mrs. Matlock! Honey-BEARS are BEAUTIFUL, BLISSFUL, and BOISTEROUS! I'm absolutely BANANAS over them...aren't you! Hi! You always make me smile here so come visit real soon! I love all the bears and bees and beautiful posts you bring to us! 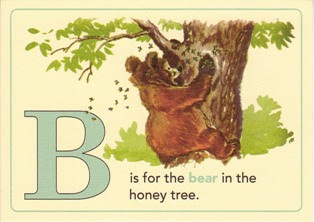 Thank you very much, the B is for a very greedy bear. Oh so yummy is my Pumpkin Spice tea! I just got my B post in, and things are quite interesting as I'm recovering from a very bad cat attack...which happened the night before we flew out at 6:00 am....got in the middle of my daughter's cat and my cat.....this was a first ever, and it's hard being my right arm and hand! I'm looking forward to seeing all the posts tomorrow! Gotta sleep! Hi, Jenny! Linking up a recipe from my daughter, Elizabeth. We call her Little Bit. When my youngest was small, she couldn't say either one of those names so she said, "Bit-it" and it stuck. You'll be glad to know that my "B" post is short!